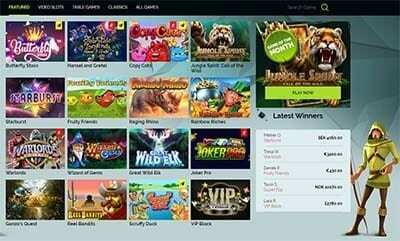 Wixstars is an online casino best geared towards new players seeking the best all-round gambling experience. Operating out of Romania since 2016 and servicing players worldwide with a variety of the best games from renowned software providers like NetEnt and Play’n Go, Wixstars has established a fairly decent reputation among players for fast payouts and trustworthy licensing. Find out if it’s worth your time and money in our review. Before we get stuck into the full review, Wixstars only accepts players from the following regions: Australia, Austria, Canada, Finland, Germany, Ireland, Netherlands, New Zealand, Norway, Sweden, Switzerland and the United Kingdom. Wixstars is a no-download, instant-play online and mobile casino. Like most modern casino sites, instant-play means the games are fully accessible and playable directly in your device’s Web browser without the need to download special casino software (just keep your browser’s Flash plugins up-to-date). When you click on any of the games offered at Wixstar, the site automatically loads the game in a smaller window in the same tab. Wixstars also offers full support for practice play for all of their games (excluding live dealer), meaning anyone can test the games for free without putting down any real money by clicking the ‘Play for Fun’ button. This option is available even before you sign up for an account, which we appreciate as it allows new players to test the waters before committing. While Wixstars’ design and interface does not really stand out from the pack, our overall online gaming experience at Wixstars proved seamless and stress-free whenever it came to jumping into a new spin of roulette or spin of the latest slots. Wixstars Casino is fully optimised for mobile devices, including Android, iOS and Windows OS smartphones (Google Nexus, iPhone, Samsung Galaxy, Windows Phone) and tablets (iPad, Microsoft Surface Samsung Galaxy Tab). The site aesthetic remains the same but the interface and navigation make full use of the smaller touch-based screens of mobile platforms, and everything loads fast and simple without delay. Wixstars is one of the best mobile casinos we have encountered when it comes to preserving the standard desktop casino experience in the mobile package. We’ve noted nearly every single online video slot and every single table game from the normal Wixstars Casino is also available in the mobile version, something that is rare considering not all games are ported to mobile devices. Wixstars definitely deserve some praise for this substantial effort, and we have to see their live dealer casino offerings also make the jump to portable devices in the near future. Wixstars offers all readers of BettingPlanet a generous welcome bonus package split into three steps and awarded over three days. 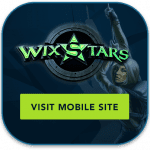 All you need to claim your Wixstars sign up bonus is to register for an account via our Wixstars review links, and follow the following steps. First Deposit Bonus: Deposit at least $10 and Wixstars will match it by 100% up to a value of $200 and award your new account with 20 free spins to use on selected online video slots. Second Deposit Bonus: Deposit at least $20 on the second day of being a member at Wixstars and the casino will award your account with 40 free spins to use on selected online video slots. Third Deposit Bonus: Deposit at least $20 on the third day of being a member at Wixstars and receive 40 free spins. Outside of their welcome package, Wixstars seems fairly scant when it comes to additional promotions but they do offer one-off daily bonuses and cash-back schemes to encourage play from their members. We feel they can definitely up the ante in the bonuses department by a significant amount if they want to stand toe-to-toe with other online casinos offering consistent and higher value to their members, such as House of Jack or Slots Million. Note: All bonuses and promotions at Wixstars adhere to 35X wagering requirements before you can withdraw any winnings. This is fairly standard when compared to many other online casinos, but isn’t as low as a few competitors we have reviewed. Wixstars is a multi-software provider, meaning it hosts casino games from a number of different makers rather than just one. Currently, it boasts over 290 of the very best video slots, table games and live dealer games from the like of Evolution Gaming, Microgaming, Net Entertainment, NeoGames and Play’n Go, and we were very impressed with the overall quality of the line-up. 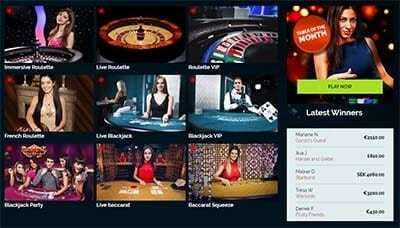 Once you are logged in (or testing games via free play mode) click on the ‘Casino Lobby’ tab to view Wixstars’ slots and table games selection or ‘Live Casino’ for their live dealer titles, which get their own specialised section due to their unique premise and popularity. In terms of casino deposit and withdrawal methods, Wixstars Casino has one of the best out there. They support a range of the world’s most popular banking services (MasterCard, Visa), along with country-specific options that covers a huge portion of the world and offers choice rather than alienating parts of their potential player-base. The Wixstars site has a handy FAQ that covers all of the most common and essential banking questions – this a major plus in our books given out obtuse and vague many other online casinos targeting certain countries tend to be to avoid hard questions on restrictions and local laws. As standard with all online casinos, you must provide identification documentation and have your details verified by the casino before you can successfully withdraw your cash. Wixstars currently supports the following currencies: AUD, BRL, CAD, CNY, EUR, GBP, SEK, USD. Most deposit options process instantly but some take up to 8 business days, and not all options are available for withdrawals, so make sure to check the Wixstars banking FAQ for individual service specifics (minimum and maximum deposit and withdrawal limits, for example). One specific thing we will note is MasterCard at Wixstars Casino cannot be used as a withdrawal option in any country, which will prove to be a bit of a hassle for many players. Wixstars.com is a brand owned by Brightnet, a company incorporated under the laws of Romania and is operated by Aspire Global International LTD., a Malta-based company. The online and mobile casino is fully licensed and regulated by the Malta Gaming Authority and the United Kingdom Gambling Commission (for Great Britain players only), two of the world’s most trusted advanced gaming jurisdictions and government-backed regulators. Wixstars also employs 128-bit Secure Socket Layer digital encryption technology safe-guarding all financial transactions on the site and their Fair Play policy is verified by iTech Labs, a third-party auditing service that keeps online casinos in check. Overall, we’re pretty happy with the level of regulation Wixstars has undergone and the site openly lists its licensing numbers and documentation on the bottom of every page; the transparency is definitely welcome and basically gives us players extra peace-of-mind that they are running a fair and responsible online casino and gaming environment for players. Overall, we found Wixstars to offer a great selection of the world’s best casino software and a safe, licensed and regulated environment for all of its players. Its regulation under the MGA and UKGC means it has gone through the highest standard of auditing and licensing to be allowed to operate, and the site’s games support from Evolution and Microgaming means it offers some of the best live dealer and video slots out on the Internet. 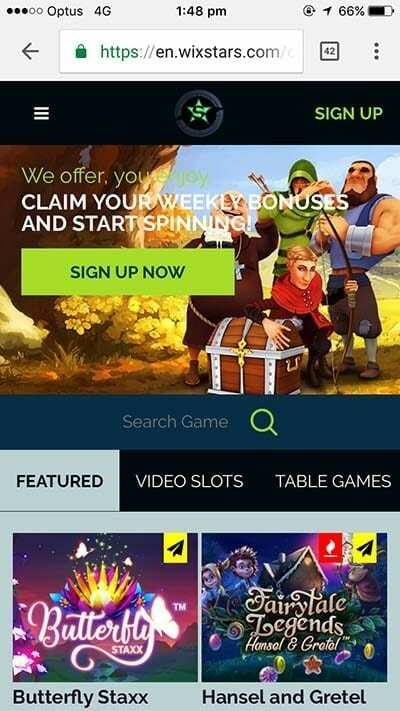 While still growing in terms of games and bonuses, we can highly recommend Wixstars at the moment for both new and experienced casino players looking for an up-and-coming cleanly designed site, simple in premise and fully supporting a range of trusted deposit and withdrawal options for easy betting and withdrawals. Sign up at Wixstars.com today via our review to claim your exclusive real money welcome bonus after your first three deposits.